Professional beauty products distributor SweetSquared considers using Microsoft Office 365 alongside browser-based SaaS. Microsoft claimed its cloud-based service can help further reduce IT resources, simplify current systems and increase employee productivity. Professional beauty products distributor SweetSquared currently uses Microsoft's standard Office suite, but plans to deploy Microsoft Office 365. The company is already using software-as-a-service (SaaS) - namely NetSuite - for its accounts and customer relationship management (CRM). It is also using Microsoft Office Web Apps and Amazon Web Services (AWS). SweetSquared imports and distributes beauty products in the UK, selling directly to salons via 20 staff in the UK head office and 10 warehouse employees. It is an example of a small company using browser-based SaaS to run the business. SweetSquared managing director Samuel Sweet believes using browser-based cloud services will allow more small businesses to focus less on managing and maintaining hardware and more on driving greater efficiencies and streamlined processes for customers. For instance, the company is developing an image request system using the Amazon Web Services application programming interface (API). This will allow product images to be stored in the cloud and requested by customers for advertising purposes. On the accounting side, SweetSquared previously used QuickBooks and bespoke software for sales and stock systems. Michael Cheung, head of IT systems development at SweetSquared, says it was too difficult to synchronise the three separate systems manually so the beauty products distributor started using NetSuite SaaS two years ago. NetSuite's CRM and accounting systems integrate with SweetSquared's website and include management of its inventory to allow the company to maintain the right levels of stock. "Workflow wise, NetSuite has streamlined everything. In terms of man-hours, a one-hour job now takes about 10 minutes," he said. NetSuite has reduced Cheung's administration duties, so he now spends 90% of his time on workflow innovation, including building customer apps on top of NetSuite's products (see box below). Following on from its success with NetSuite, the company is now considering how it could deploy Office 365. "We are looking at using Microsoft Office 365 as we have become familiar with using everything through a browser," he said. Cheung said staff training would not be needed as most of its 30 UK staff are already used to accessing browser-based NetSuite services and currently use Microsoft Office Web Apps. 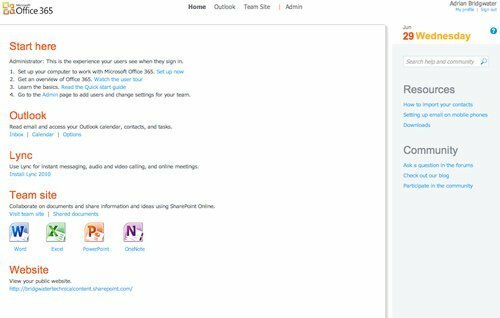 Microsoft launched Office 365, a cloud-based version of its office productivity suite which combines communications and collaboration for smaller businesses, at the end of June 2011. The service costs $6 a month per user and provides users with Microsoft Office Web Apps, Exchange Online, SharePoint Online and Lync Online. "If staff want to work from home, they can, and I don't have to set up VPN [virtual private network] access and mobile access," Cheung added. He said the company can also outsource mailboxes using Microsoft Hosted Exchange. He believes cloud-based software has allowed the company to streamline its processes. Cheung said the biggest challenge surrounding the use of browser-based cloud services, such as NetSuite or Office 365, is ensuring a reliable broadband connection at all times. The company's introduction of a dedicated line aims to avoid any downtime. "We recently renewed and upgraded to a 100% dedicated line so we don't share with anyone else," he said. Browser-based applications such as NetSuite and Office 365 can be customised to integrate with business processes. It has also developed an integrated application to scan labels, which reduces shipping preparations. "What used to take five minutes now only takes seconds," said Michael Cheung, head of IT systems development at SweetSquared. Previously, when warehouse staff picked a package, it would take five minutes to type out labels manually. The process is now automated. Interesting read! In general, I think SaaS helps SMBs better their business processes for them to be able to level to large scale businesses most especially in this tech-heavy era we are in now where the digital corporate world is getting bigger and bigger.